Over the past week, news has been circulating about Time Inc.’s plan to sell the beloved Menlo Park building Sunset calls home. Here, instead of speculating about the future, we’re going to take a look at the birth of this office. It’s Throwback Thursday, after all. The story starts in 1951, when Sunset moved from its San Francisco headquarters out to the Bay Area suburbs. 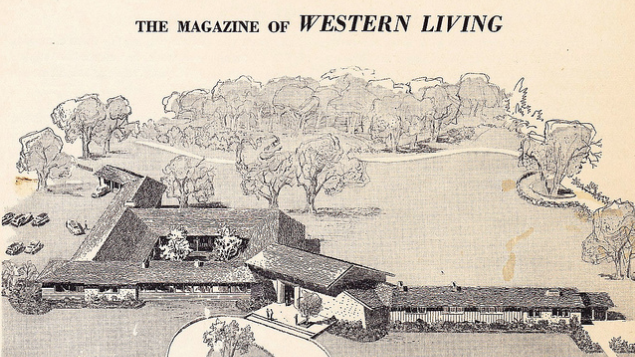 The architect was Cliff May, a Los Angeles resident who built the space (his first commercial one) to look like a classic ranch-style home on 7 acres of property. Thomas Church landscaped the gardens (each one representing the different climates of the West) and Charlotte Hinckley helped design the interior (an ode to the “craftsmanship of the early Spanish-Californians”). Even after it was up and running, Sunset staffers operated the office much like what they preached in their magazine: designing, organizing, planting, and cooking. The same holds true today. In August of 1952, the magazine ran an article touring readers through the space. “On the next pages…we invite you on a walk through Sunset’s new home,” the headline says. Below are some of the photographs and their exact captions that ran. I went around and took similar pictures, each below its vintage inspiration. Today, the Sunset office looks much the same—an ode to the West in all of its grandeur and all of its beautiful detail. Come take a look while you still can. We’re open to guests each workday, from 9 a.m. until 4 p.m.